Collecting antiques is not a new idea. Historical records indicate that 3,000 years ago, there were collectors and dealers of coins and artifacts in Egypt. Today, collecting antiques is different than it was in Egyptian times. For one, now it is a matter of semantics. According to Merriam-Webster’s, an antique must be 100 years old. This places many contemporary collectors’ items outside the realm of the antique. In fact, the majority of collected items today would be considered vintage collectibles. The word “vintage” usually refers to wine—specifically, a fine or quality vintage from a particular year. The word can, however, also refer to a year or period, a time that mostly defines the style. That is how we apply it to the wristwatch, as well as many other collected items like classic automobiles and vintage clothing. Vintage motorcycles are also quite common. The great architect Le Corbusier suggested that a house was a machine for living in. If this is so, then the watch is a machine for living with, and people do live with their watches. They sleep with them, shower with them, and yes, they even make love with them, literally and figuratively. Few things have consumed man’s creativity more than the perfection of time. History is filled with accounts of great philosophers and scientists who spent years studying time. Henry Ford was a watchmaker and attributed his ideas in automobile manufacturing to modern watchmaking production. Like most of man’s creations, watches are a clear reflection of the political and historical events of the times, and like so many things in our world, the watch’s development had direct military applications. In fact, it is difficult to find something man has created or invented that has not at one time or another been utilized or studied by the military, either offensively, defensively, or both. Regarding the watch, one of its more fundamental applications was in the military. For example, the ability to launch an attack on two fronts required each regiment to have synchronized time. Napoleon Bonaparte wore a watch in his pocket produced by the world’s greatest watchmaker, Abraham-Louis Breguet, in the late 1700s. Napoleon believed that the difference between him and his opponents was that he understood the value of five minutes. He not only knew what could happen in that amount of time, but he also had the power in his pocket to count it off, watch it pass accurately, and contemplate what he could accomplish in those five minutes. Eli was not the only famous person to buy time to remember the time. Watches are frequently purchased as gifts. Malcolm McDowell, an actor well known for his role in A Clockwork Orange and dozens of other impressive films, is an avid watch collector. He told me, “It started when I received a watch as gift in 1979 at the opening of a play I was in.” After that, he said he was hooked: “I decided to buy a watch every time I did a play or film or something.” Rolex watches made from 1920 through 1940 are Malcolm’s favorite models. Speaking of time, Malcolm shared a story about the title A Clockwork Orange. He had asked Anthony Burgess, who wrote the original novel, where he came up with the name. Anthony said he was in a pub in the east end of London, and one of the old-guy regulars in there said (in a cockney accent), “Yes, he’s as queer as a clockwork orange.” It always stuck with him, this title, which means he’s as peculiar as a clockwork orange or God knows what. “Your imagination has to do the rest,” Malcolm said. There are some rare collectors who are so ahead of their time that they collect before it happens, almost in anticipation of the future. The writer-musician-artist Artie Shaw made it a habit to stop in to the Cartier shop in New York during the 1930s just to see what was new. “I was very successful as a musician and band leader, and I bought a watch every few weeks just to confirm my success, to pinch myself,” Artie said. Artie was the kind of collector who bought only what moved him and what was considered at the time to be the highest level of craftsmanship. He was an artist with an artist’s eye for beauty and based most of his decisions on the esthetic impressions the watches made on him. “The entire collection was stolen from me while I was staying in a hotel in the late 1930s,” he said. “The insurance company would only pay out about $40,000, but I had spent well over that on the items.” Artie shared that their reasoning was that since the stolen watches were never recovered, they were not sure the robbery ever occurred. In today’s world, that would be a ridiculous argument. What Makes Something Rare ? One of the most exciting aspects about collecting watches is that you have the opportunity to participate in 500 years of scientific experiments, as well as the entire history of contemporary design spanning the Egyptian revival, Art Nouveau, Art Deco, and modernism—and all this for as little as $300-$400. Now, let’s take a moment to consider what it means to collect something like a watch that is rare. It might be rare because there were only a few pieces made, but in many cases, it is rare because it is still here. That might seem like a strange idea, but precious metals have been used for thousands of years to finance wars and expansions. 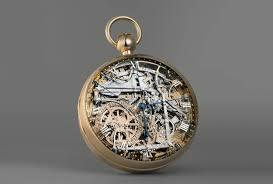 That means that exceptional and unique watches as well as jewelry have been destroyed for their precious metal value. Gold and silver have been melted down, turned into jewelry, and melted down again and again for thousands of years. It’s true that new gold and silver are still being mined all the time, but old precious metals are also being refined from old jewelry and turned into new jewelry (or bullion to be used for other purposes). The newly mined gold is mixed with old, refined gold, so each piece of modern jewelry, as well as old watches and jewelry, have trace elements of ancient gold. Somewhere in every ring, each watch, and every necklace are elements of jewelry that were worn by Cleopatra, Charlemagne, the Medicis, or even George Washington. So, the next time you look at your watch, touch it for good luck, because you are linked to the past and the future. Maybe that is why jewelry historically has such a magical and mysterious attraction for us all. Today’s modern watch collector has a lot of decisions to make. If you are a new collector fascinated by watches and time (and hopefully you will be after reading this), you will have to focus in on a category to make your collecting experience as rich as possible. It does not really matter what you are collecting. Whether it’s watches, cars, clothing, or furniture, the same decision will have to be made. You will also need to define your own personal style, since wearing a vintage or antique watch is part of the fun of collecting them. Many types of collections, such as stamps and coins, do not directly relate to people’s lives. They cannot be practically used, but they still require safekeeping. A vintage watch can be used and, surprisingly in these modern times, actually depended upon. The best way to start is to decide what kind of a budget you have and where your interests are. There are many directions you can take. Some people collect a particular brand by name or period. Some collect by style or country, like American watches made before World War I, commonly called “trench watches” or military styles. Some collectors only buy chronograph or calendar watches. There are collectors who only purchase “new old stock” watches and do not care if it is a humble Bulova for $400 or a very expensive Patek Philippe for $10,000. You might like to collect every model made by a particular house during a particular era. This gets harder as your collection gets larger, but you can refine the collection by selling off the less-than-perfect duplicates. Many collectors are, in actuality, investors. They collect for value, and some have done very well. Personally, I like to collect watches that represent an idea or a theme. I have watches in my collection of modest value worth $200 or $300, but they accurately represent a theme or idea. For example, I have several watches that are excellent examples of Art Deco design and others that represent the shapes they are called, such as a simple, tortoise-shaped watch called a “tortue.” I have several watches that are very valuable, high-quality copies of famous designers’ ideas. I also like to collect commemorative pieces. These are not necessarily expensive, but they define an era or highlight an event. For instance, I have a few early examples of waterproof watches that were produced during Word War I. In addition, I like to collect watches with great engravings and historical provenance. I have a watch in my collection that was owned by Commander Richard E. Byrd—specifically, the Longines chronograph he wore on his expedition to the North Pole. I have many other watches owned by famous people, which were given to them by famous people. Plus, I have a small collection of very old wristwatches—really antique pieces, with some as old as 200 years. Having been in the watch field my entire life, I finally decided to try my hand at watch manufacturing. This has proven to be more difficult than I imagined. Producing my own watch required that I work with nearly 30 different companies in many languages on individual aspects of manufacturing and packaging. 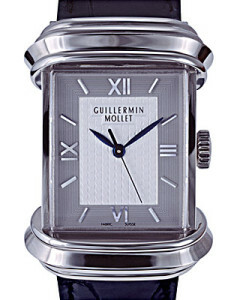 It has taken several years, but I am proud to now offer the premier edition of the Guillermin Mollet watch. At under $6,000, it is probably one of the most sophisticated watches being produced today. It was inspired by a design originally produced for Patek Philippe in 1951. This striking watch is available in three colors of gold with a variety of dial designs. The high-grade, automatic movement has a power reserve of nearly 40 hours! The house of Guillermin Mollet was located in the historic Place Vendome in Paris. They designed exquisite jewelry and watches for international film stars and European royalty. There are still some bargains out there in the watch trade, but you will have to look carefully. The Omega line offers a lot of great styling and affordability, as does Longines, Le Coultre, and of course Gruen. Additionally, Bulova makes excellent watches, with hundreds of models that are very dependable and sophisticated. These lines are accurate, high quality, and serviceable, and all are affordable. As a beginner collector, it is very important to be patient and stay within your budget. Try to buy watches in good condition from a reputable dealer who will give you an opportunity to have the watch checked out with a refund policy of one week. My last piece of advice is this: Buy what you like and what you will enjoy wearing. And always spend a little bit more for the piece you really want. Do not compromise. After a month or two, the extra bit of money you would have saved will not matter, but wearing a watch that does not move you will. Remember: Collecting should be fun. If it is not fun, then it is not worth it. Sigmund Shonholtz is a watchmaker and jeweler. In 1898, Sig’s grandfather, another Sigmund Shonholtz, a respected watchmaker and jeweler, opened a small but exclusive jewelry store in Philadelphia. The firm relocated to Los Angeles in 1918 and soon became the jeweler of choice to many of Hollywood’s biggest stars. Sig is a third-generation watchmaker, and his collection is admired by watch dealers and collectors worldwide. As the above article explains, Sig has recently designed his own watch, the Guillermin Mollet, which is creating quite a stir in the world of watches. Sig is also an appraiser of timepieces on television’s Antiques Roadshow. NextNext post: Godzilla and the ’49 Merc. Gotta love yahoo, cool website. Have a nice day.